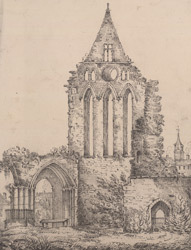 Sketch of Kilwinning Abbey in Strathclyde, Scotland. The abbey, which housed a community of Benedictine monks, dates from the 12th century and was established by Hugh de Morville. The name Kilwinning comes from a church that was said to have been founded here in the 8th century by St Winning. The church was 225 feet in length with a nave 65 feet wide and a tall steeple. The Abbey had a number of wealthy patrons and flourished until the 16th century when it was destroyed during the Reformation. This sketch depicts the tall gable of south transept with its three lancet windows.